Cate Blanchett gives an excellent performance here, stealing the show from a solid cast, and great writing. Drawing heavily from A Streetcar Named Desire, Woody Allen’s latest film looks insightfully into the life of a fallen socialite (Blanchett) who is struggling to keep herself together. It’s a film which demonstrates a strong understanding of the human condition, but it is still pitiless in its depiction of its central character, an approach that allows Blanchett to really flesh out her role psychologically, and ultimately to dominate the screen. Blue Jasmine plays around with an interesting structure; it cuts between two very different periods in it’s protagonist’s life, and it’s a technique which, whilst I wasn’t sure about it at first, came to work very well at strategically revealing story details at effective moments, whilst also showcasing Blanchett’s tremendous skill with her portrayal of Jasmine. And she really does deserve the praise that I and many others have been bestowing on her. She takes us through various emotional and mental states with such ease that it’s disarming, and I wouldn’t be at all surprised if she were take away an Oscar for her work here. But, despite appearances, it isn’t all about Blanchett here. She is supported by a great cast, with particularly good performances coming from Sally Hawkins and Andrew Dice Clay. And Woody Allen hasn’t been this sharp a writer or director in quite some time – and I really like Midnight in Paris. Still, despite my praise there are a few little bits which let this one down. The film has the occasional example of slightly odd dialogue, and there are a couple of plot developments which were somewhat predictable, and that did take away from the experience a couple of times. It’s not a masterpiece like I have heard it described, but overall though Blue Jasmine is a great film, it’s something of a return to form for Allen, and it arguably features Blanchett’s best onscreen performance to date. What is the film’s greatest strength? There’s no question as to it being Cate Blanchett’s fantastic performance. That there was occasionally a certain predictability to events, which was a shame. 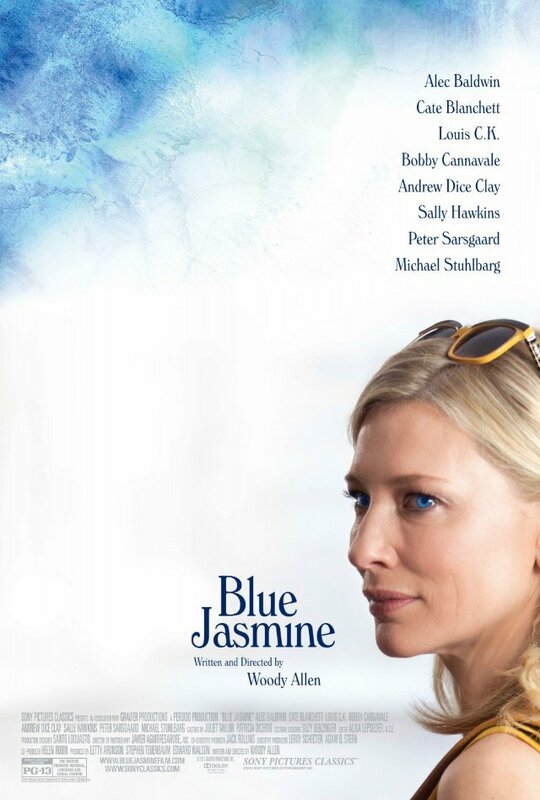 Yes I will definitely seek Blue Jasmine out again, it would only improve upon a re-watch. So what did you think? Let me know by typing out a comment below! Thanks Tom, yeah it’s not exactly overflowing with likeable characters! I did however find Ginger’s two boyfriends somewhat sympathetic, and Blanchett just held me transfixed pretty much the whole time! What I really liked about the film was how Woody Allen turned us into observers, there wasn’t much attempt to judge the characters as good or bad. Each character in one way or enough was flawed which I enjoyed as a comment on humanity. In this sense no character was particularly likeable because this would have been detrimental to the feel of the film. Yeah that’s a good point; they all felt distinctly human and flawed, and as you say we are not aligned or forced by the film to take a side really. Thank you 🙂 I am very glad that I decided to fork out the cash and check this one out! Great review, I’m a huge fan of Cate Blanchett so I should see this one. In that case this is absolutely essential viewing for you! Great review. Cate Blanchett nailed this role. Overall, I really enjoyed this film but I was a little dissatisfied with the ending: I thought it felt a little abrupt. Thanks! I see what you’re saying, for me though that was a great time to cut on. It didn’t feel like it had any further to go storywise. Great review! Cannot wait to see this! Blanchett is one of my favorite actresses and I’m a huge fan of Woody, too. Thanks buddy! You should absolutely not miss this then! It’s definitely worth watching, at least for Blanchett! I like her. One of my favourite roles she had was in I’m Not There, that astounded me! Oh yeah she is very good. Have you seen Notes on a Scandal? I have heard about it but I have never checked it out. Worth a look see? Yes it is worth a look; the film itself is OK, but it’s the acting that marks it out as one to check out. Blanchett is very good, and Judi Dench is excellent! Oh, you just sold me. Judi Dench, too? I am there! Great! You also get a pretty decent performance from Bill Nighy to look forward to too! Oh he is funny! I like him. Sounds like an outstanding cast! Yeah it’s pretty great! From memory the child actor is pretty good as well, but it’s been a while since I watched it. Do you know much about the plot? I know nothing about it. Debating whether I should get an overall look or be surprised… what do you reckon? Rough outline with no spoilers? Well, if you want to see it then you may as well go in with no real idea about it, that always makes a film an interesting experience! Basically it’s a film that’s about a lonely elderly teacher (Dench) who befriends a young new teacher (Blanchett), but who then becomes aware of a scandal and must decide how to react to it, and her new friend. That’s a fairly general outline! I like that outline, just enough to give me an idea, but not enough to be anything substantial. I am going to get my hands on it as soon as I can! Nice, It will be interesting to see what you think! As I said the film is decent, but hopefully the performances will impress you most! Thanks for putting me on this. Just checked out the poster now, I vaguely remember talk about this, though I have never seen it. No problem, always happy to make recommendations! I adore Cate Blanchett and she’s pretty much the only reason I’d rent this. Woody Allen is a hit and miss for me, I think my fave of his so far was Midnight in Paris. Oh yeah I really like Midnight in Paris too! Well I think it would definitely be worth you renting it! I completely agree. If there’s any justice in the world, Blanchett should receive an Oscar nomination for this role, and I think Sally Hawkin’s should be nominated too. You hit the nail on the head. Not a masterpiece, but still a great movie 🙂 Great review Mr. Rumsey! Yeah Sally Hawkins would be a good choice for a nomination, she was really good here! Cheers! Have you seen/do you like Midnight in Paris?